4IO Strobe Control makes it possible in machine vision applications to go without external strobe controller. Reduction of components saves space, simplifies field cabling, programming effort and saves money. Industrial cameras need a well lit object. Nowadays, nearly exclusively LED lighting equipment is used in machine vision applications. SVS-Vistek has integrated a strobe controller in its cameras. Up to 4 channels with up to 3 Amperes are supported (4IO concept) covering most of standard lighting situations. The integration of an additional controller SDK is not necessary. The combination with the integrated sequencer enables even more possibilities. Industrial cameras create images which are interpreted by machines. It is quite an effort to develop algorithms which are working on images with too much or not enough light. Therefore, well defined illumination is essential. Every machine vision application is creating the light which is best suitable for this specific application. Strobe controller are the devices to control illumination in a defined way. Trying to make the machine vision application more slim and reduce integration effort, it does make sense to integrate the light control unit into the camera. Already in the year 2005 SVS-Vistek delivered the first camers with integrated light contriol based on customer requests. Since then the number of channels as well as precision of timing has been grown leading to SVS-Visteks innovative 4IO concept. MOSFET power transistors are the foundation of the Output. The final signal is a PWM signal (puls width modulated), delivering in short time maximum 3 Ampere for lighting equipment. Lighting times can be adjusted very precisely in steps of 15 ns. 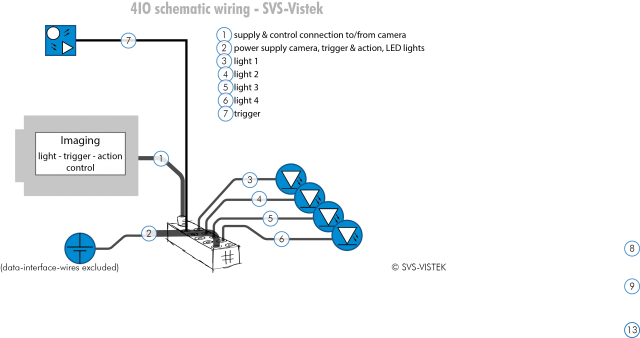 With the 4IO concept, SVS-Vistek is showing the connectors for input, output and power on the Hirose connector. By using PWM, hardly any power dissipation is generated in the camera. Thus, there is hardly any heating of the camera by the strobe controller. The PWM signal is adjusting the light output by regulating the current with the integral of the current over time. The LED always is operated with full supply voltage. If you decide to limit voltage or maximum current by circuitry design you need an additional shunt resistor in line with the LED. The camera SDK provides full access to all strobe controller parameters. You might adjust on- and off-time, lighting power, and in conjunction with the built-in sequencer as well delays and sequences. As an example, setting up a std configuration with the lighting equipment being on 80% power only while the camera is exposing is done easily and the camera with its hardware will do the execution job - without writing additional software stuff. There is no need to have a synchronisation line or similar - this makes jitter issues or external induced electrical spikes unknown. 4IO opens a wide spectrum of applications. It does make sense where space or money is limited. 4IO strobe controller provide a strong alternative to conventional external LED strobe controller as long the maximum current does not exceed 3 Amperes. Thus, the number of external devices are reduced, field cabling is reduced, programming effort is less as well. This makes your machine vision application more economic and easier in terms of long term maintenance. To make the tedious task of field cabling more easy and transparent, SVS-Vistek offers its breakout box. Connect your sensors, camera, power supply and lighting equipment according to common machine builder standards. The connection is using 3-pole sensor/actor cables and is rated IP67. Like this, 4IO helps you to save cables, space, effort and money.